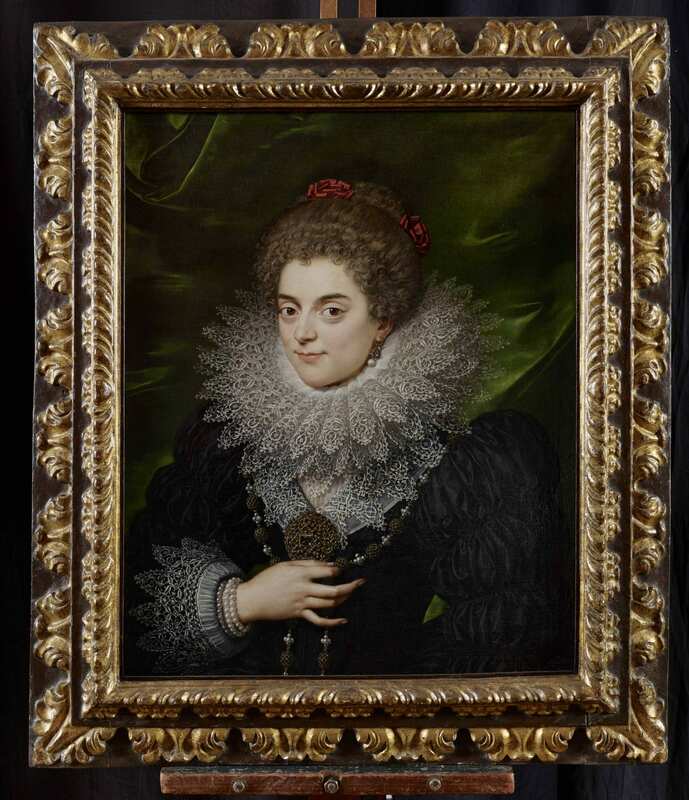 This newly discovered portrait by Frans Pourbus the Younger (1569 - 1622) only recently came to light at auction, attributed to an unknown seventeenth century Flemish artist, and erroneously identified as Isabelle de Bourbon. Tajan, Paris, 15 June 2016, lot 48. Clearly painted by Frans Pourbus the Younger during his time in the royal court of Marie de Medici and Louis XIII, it must indeed represent a lady of the Bourbon court. 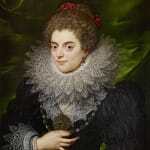 It is dateable by costume, from the prominent reticella lace ruff, tightly coiled hairstyle and waistline to circa 1615. Her richly ruched black silk dress is a fine example of French court dress at that time and the lavish table-cut diamond brooch set against blackened foil is of the highest order, a jewel fit for a royal. 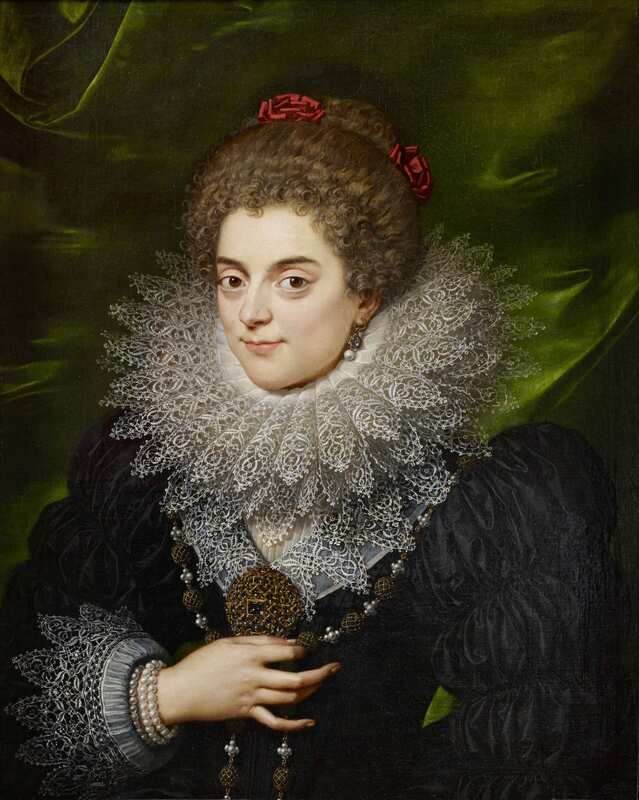 She playfully holds a long and intricate necklace of filigree gold beads and clustered pearls, another indication of the sitter’s extreme wealth and privilege, as well as the jauntily angled pendant pearl and diamond earring that sits on her lace ruff. Her insouciant expression, unusual for its smile, is strongly individualised, and perhaps she has something in particular to smile about – the red rosettes in her hair emulate carnations, indicating this may be an engagement portrait. 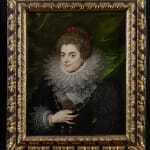 Frans Pourbus the younger was born in Antwerp and naturalized French in 1617. He was undoubtedly the most influential court painter of the late sixteenth and early seventeenth centuries. He developed an extraordinary canon of royal portraiture, and his success was so prodigious that it was only the new artistic approach of Rubens or Van Dyck that would take portraiture in a different direction. His portraits of the French royals in the Bourbon court of Louis XIII served as the prototype for the ultimate princely portrait of his day, and were widely disseminated through foreign courts as an instrument and indication of French power. Pourbus had established a style of painting that was recognized throughout the courts of the Hapsburgs, Bourbons or Medici where he worked, and his importance in the French royal court was attested by the honour of taking up residence at the Louvre itself. Pourbus sought to both faithfully render a likeness, whilst also aspiring to an idealism – the ‘royal dignitas’ which singles out his work. He endeavoured to represent above all the status and character of the sitter through a set of attitudes, gestures, looks and the sumptuous splendor of their costumes, while the platicity of their flesh, the careful modelling of their faces and hands, evoke the delicacy of French enamels of this period. Son of Frans Pourbus the Elder and grandson of Pieter Pourbus, he trained in his grandfather’s studio and was accepted as a master in Antwerp in 1591. During his early years in Antwerp, until circa 1590, Pourbus’ style was strongly influenced by the work of his father and grandfather. Although his style was individualised during the course of his artistic development, he always remained faithful to the Flemish tradition and never embraced the baroque movement. Thus Pourbus earned the appreciation of seventeenth century French classicists, and came to be regarded as a founding father of French portraiture, taking forward the aesthetic established by the likes of François Clouet (c.1510 – 1572). In the 1590s Pourbus worked for the Archdukes Albert and Isabella at their court in Brussels, but departed for Mantua in 1600, where he was appointed court painter to Vincent II Gonzaga, Duke of Mantua until 1609. He received numerous commissions from the ducal family and travelled to Innsbruck in 1603 to depict members of the family, followed by Turin in 1605 – 1606, and Paris in 1613, where he painted the young Louis XIII, then Dauphin, and his mother Marie de’ Medici, the sister of the Duchess of Mantua. Following another trip to Italy in 1607, he returned to Paris where he entered the service of Marie de’ Medici and subsequently that of Louis XIII in 1616, until his death in 1622. We are grateful to Professor Aileen Ribeiro for dating the portrait for us on the basis of costume. Thieme and Becker, Allgemeines Lexikon der bildenden Künstler, Leipzig: E.A. Seemann 1933, p. 315-319.